Laura Laprell et al. characterize diethylamino-azo-diethylamino (DAD), a third-generation photoswitch that is capable of photosensitizing bipolar cells to restore visual function in blind mice. 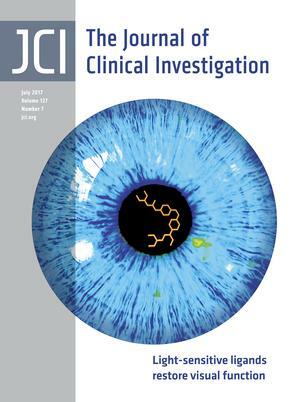 The cover shows the DAD photoswitch in light-activated cis configuration within an eye. Image credit: Laura Laprell. Citation Information: J Clin Invest. 2017;127(7):2530-2532. https://doi.org/10.1172/JCI94606. Osteoclasts are the cells responsible for bone resorption, a process that is essential for the maintenance of healthy bones. Bone diseases, such as osteoporosis, which are characterized by high rates of bone resorption and loss of bone mass, may benefit from treatments that inhibit osteoclast formation and/or function. The RANKL/RANK pathway is critical for both osteoclast formation and function, and these effects are thought to be mediated by the transcription factor nuclear factor of activated T cells, cytoplasmic 1 (NFATc1). In this issue of the JCI, Bae et al. challenge the convention that NFATc1 is the sole critical regulator of RANKL/RANK-dependent osteoclast activation. Specifically, the authors show that MYC drives metabolic reprogramming in osteoclasts and that MYC induces estrogen receptor–related receptor α (ERRα) to regulate osteoclastogenesis. Importantly, both loss of MYC and pharmacological inhibition of ERRα attenuated bone loss in a mouse model of osteoporosis. Together, the results of this study suggest that the MYC/ERRα pathway should be further explored as a drug target for bone diseases. Citation Information: J Clin Invest. 2017;127(7):2533-2535. https://doi.org/10.1172/JCI95008. Citation Information: J Clin Invest. 2017;127(7):2536-2538. https://doi.org/10.1172/JCI95329. While antiretroviral therapy (ART) can reduce HIV-1 to undetectable levels, the virus generally reappears if treatment is stopped. Resurgence of the virus is due to the reactivation of T cells harboring latent integrated provirus, and recent studies indicate that proliferation of these latently infected cells helps maintain the HIV-1 reservoir. In this issue of the JCI, Lee et al. evaluated CD4+ T cell subsets to determine whether certain populations are more likely to harbor full-length, replication-competent provirus. The authors identified an enrichment of clonally expanded Th1 cells containing intact HIV-1 proviruses, suggesting that this polarized subset contributes to the persistence of the reservoir. Strategies to target these provirus-harboring cells need to be considered for future therapies aimed toward HIV-1 cure. Citation Information: J Clin Invest. 2017;127(7):2539-2540. https://doi.org/10.1172/JCI95386. WNT proteins drive the development and maintenance of many tissues, including bone. It is less clear which of the many WNT proteins act on bone or where these WNTs act in the skeleton; however, loss-of-function mutations in WNT1 cause bone fragility in children and adults. In this issue of the JCI, Joeng and colleagues demonstrate that bone formation is under the control of WNT1 produced by osteocytes, the cells that reside deep in the bone matrix and form dendritic networks. The implication of WNT1 in the control of bone formation identifies a potential new target for the treatment of low bone mass disorders, such as osteoporosis. Citation Information: J Clin Invest. 2017;127(7):2541-2554. https://doi.org/10.1172/JCI88696. TGF-β is considered a master switch in the pathogenesis of organ fibrosis. The primary mediators of this activity are the SMAD proteins, particularly SMAD3. In the current study, we have developed a cell-penetrating peptide (CPP) conjugate of the HIV TAT protein that is fused to an aminoterminal sequence of sorting nexin 9 (SNX9), which was previously shown to bind phosphorylated SMAD3 (pSMAD3). We determined that specifically preventing the nuclear import of pSMAD3 using the TAT-SNX9 peptide inhibited profibrotic TGF-β activity in murine cells and human lung fibroblasts as well as in vivo with no demonstrable toxicity. TGF-β signaling mediated by pSMAD2, bone morphogenetic protein 4 (BMP4), EGF, or PDGF was unaffected by the TAT-SNX9 peptide. Furthermore, while the TAT-SNX9 peptide prevented TGF-β’s profibrotic activity in vitro as well as in 2 murine treatment models of pulmonary fibrosis, a 3–amino acid point mutant that was unable to bind pSMAD3 proved ineffective. These findings indicate that specifically targeting pSMAD3 can ameliorate both the direct and indirect fibroproliferative actions of TGF-β. Citation Information: J Clin Invest. 2017;127(7):2555-2568. https://doi.org/10.1172/JCI89935. Osteoporosis is a metabolic bone disorder associated with compromised bone strength and an increased risk of fracture. Inhibition of the differentiation of bone-resorbing osteoclasts is an effective strategy for the treatment of osteoporosis. Prior work by our laboratory and others has shown that MYC promotes osteoclastogenesis in vitro, but the underlying mechanisms are not well understood. In addition, the in vivo importance of osteoclast-expressed MYC in physiological and pathological bone loss is not known. Here, we have demonstrated that deletion of Myc in osteoclasts increases bone mass and protects mice from ovariectomy-induced (OVX-induced) osteoporosis. Transcriptomic analysis revealed that MYC drives metabolic reprogramming during osteoclast differentiation and functions as a metabolic switch to an oxidative state. We identified a role for MYC action in the transcriptional induction of estrogen receptor–related receptor α (ERRα), a nuclear receptor that cooperates with the transcription factor nuclear factor of activated T cells, c1 (NFATc1) to drive osteoclastogenesis. Accordingly, pharmacological inhibition of ERRα attenuated OVX-induced bone loss in mice. Our findings highlight a MYC/ERRα pathway that contributes to physiological and pathological bone loss by integrating the MYC/ERRα axis to drive metabolic reprogramming during osteoclast differentiation. Citation Information: J Clin Invest. 2017;127(7):2586-2597. https://doi.org/10.1172/JCI90832. Citation Information: J Clin Invest. 2017;127(7):2662-2677. https://doi.org/10.1172/JCI92508. Citation Information: J Clin Invest. 2017;127(7):2678-2688. https://doi.org/10.1172/JCI92617. Citation Information: J Clin Invest. 2017;127(7):2697-2704. https://doi.org/10.1172/JCI93465. Citation Information: J Clin Invest. 2017;127(7):2705-2718. https://doi.org/10.1172/JCI92335. Citation Information: J Clin Invest. 2017;127(7):2725-2738. https://doi.org/10.1172/JCI92167. Patients with coronary artery disease (CAD) are at high risk for reactivation of the varicella zoster virus (VZV) and development of herpes zoster (HZ). Here, we found that macrophages from patients with CAD actively suppress T cell activation and expansion, leading to defective VZV-specific T cell immunity. Monocyte-derived and plaque-infiltrating macrophages from patients with CAD spontaneously expressed high surface density of the immunoinhibitory ligand programmed death ligand-1 (PD-L1), thereby providing negative signals to programmed death-1+ (PD-1+) T cells. We determined that aberrant PD-L1 expression in patient-derived macrophages was metabolically controlled. Oversupply of the glycolytic intermediate pyruvate in mitochondria from CAD macrophages promoted expression of PD-L1 via induction of the bone morphogenetic protein 4/phosphorylated SMAD1/5/IFN regulatory factor 1 (BMP4/p-SMAD1/5/IRF1) signaling pathway. Thus, CAD macrophages respond to nutrient excess by activating the immunoinhibitory PD-1/PD-L1 checkpoint, leading to impaired T cell immunity. This finding indicates that metabolite-based immunotherapy may be a potential strategy for restoring adaptive immunity in CAD. Citation Information: J Clin Invest. 2017;127(7):2751-2764. https://doi.org/10.1172/JCI90921. Autosomal dominant polycystic kidney disease (ADPKD) is driven by mutations in PKD1 and PKD2 genes. Recent work suggests that epigenetic modulation of gene expression and protein function may play a role in ADPKD pathogenesis. In this study, we identified SMYD2, a SET and MYND domain protein with lysine methyltransferase activity, as a regulator of renal cyst growth. SMYD2 was upregulated in renal epithelial cells and tissues from Pkd1-knockout mice as well as in ADPKD patients. SMYD2 deficiency delayed renal cyst growth in postnatal kidneys from Pkd1 mutant mice. Pkd1 and Smyd2 double-knockout mice lived longer than Pkd1-knockout mice. Targeting SMYD2 with its specific inhibitor, AZ505, delayed cyst growth in both early- and later-stage Pkd1 conditional knockout mouse models. SMYD2 carried out its function via methylation and activation of STAT3 and the p65 subunit of NF-κB, leading to increased cystic renal epithelial cell proliferation and survival. We further identified two positive feedback loops that integrate epigenetic regulation and renal inflammation in cyst development: SMYD2/IL-6/STAT3/SMYD2 and SMYD2/TNF-α/NF-κB/SMYD2. These pathways provide mechanisms by which SMYD2 might be induced by cyst fluid IL-6 and TNF-α in ADPKD kidneys. The SMYD2 transcriptional target gene Ptpn13 also linked SMYD2 to other PKD-associated signaling pathways, including ERK, mTOR, and Akt signaling, via PTPN13-mediated phosphorylation. Citation Information: J Clin Invest. 2017;127(7):2765-2776. https://doi.org/10.1172/JCI85736. Citation Information: J Clin Invest. 2017;127(7):2789-2804. https://doi.org/10.1172/JCI92079. Citation Information: J Clin Invest. 2017;127(7):2815-2828. https://doi.org/10.1172/JCI91788. Runt-related transcription factor 1 (RUNX1) is generally considered to function as a tumor suppressor in the development of leukemia, but a growing body of evidence suggests that it has pro-oncogenic properties in acute myeloid leukemia (AML). Here we have demonstrated that the antileukemic effect mediated by RUNX1 depletion is highly dependent on a functional p53-mediated cell death pathway. Increased expression of other RUNX family members, including RUNX2 and RUNX3, compensated for the antitumor effect elicited by RUNX1 silencing, and simultaneous attenuation of all RUNX family members as a cluster led to a much stronger antitumor effect relative to suppression of individual RUNX members. Switching off the RUNX cluster using alkylating agent–conjugated pyrrole-imidazole (PI) polyamides, which were designed to specifically bind to consensus RUNX-binding sequences, was highly effective against AML cells and against several poor-prognosis solid tumors in a xenograft mouse model of AML without notable adverse events. Taken together, these results identify a crucial role for the RUNX cluster in the maintenance and progression of cancer cells and suggest that modulation of the RUNX cluster using the PI polyamide gene-switch technology is a potential strategy to control malignancies. Citation Information: J Clin Invest. 2017;127(7):2829-2841. https://doi.org/10.1172/JCI90562. Citation Information: J Clin Invest. 2017;127(7):2842-2854. https://doi.org/10.1172/JCI90152. Citation Information: J Clin Invest. 2017;127(7):2855-2867. https://doi.org/10.1172/JCI89934. Citation Information: J Clin Invest. 2017;127(7):2868-2880. https://doi.org/10.1172/JCI92008. Obesity increases sympathetic nerve activity (SNA) via activation of proopiomelanocortin neurons in the arcuate nucleus (ArcN), and this action requires simultaneous withdrawal of tonic neuropeptide Y (NPY) sympathoinhibition. However, the sites and neurocircuitry by which NPY decreases SNA are unclear. Here, using designer receptors exclusively activated by designer drugs (DREADDs) to selectively activate or inhibit ArcN NPY neurons expressing agouti-related peptide (AgRP) in mice, we have demonstrated that this neuronal population tonically suppresses splanchnic SNA (SSNA), arterial pressure, and heart rate via projections to the paraventricular nucleus (PVN) and dorsomedial hypothalamus (DMH). First, we found that ArcN NPY/AgRP fibers closely appose PVN and DMH presympathetic neurons. Second, nanoinjections of NPY or an NPY receptor Y1 (NPY1R) antagonist into PVN or DMH decreased or increased SSNA, respectively. Third, blockade of DMH NPY1R reversed the sympathoinhibition elicited by selective, DREADD-mediated activation of ArcN NPY/AgRP neurons. Finally, stimulation of ArcN NPY/AgRP terminal fields in the PVN and DMH decreased SSNA. Considering that chronic obesity decreases ArcN NPY content, we propose that the ArcN NPY neuropathway to the PVN and DMH is pivotal in obesity-induced elevations in SNA.